The Christian calling is far above what man thinks it is. While most of the Christian world is concerned about whether they are saved or not, God wants His children to go beyond the starting gate to run the race set before us. If you’re still wondering if you’re saved or not, I venture to say you’re lacking some very clear instruction from God’s Word. I’ll help you out with that in this article, but we want to go beyond that — to perfection. I John 5:13 These things have I written unto you that believe on the name of the Son of God; that you may know that you have eternal life, and that you may believe on the name of the Son of God. How can God say it any plainer? The words in this verse are very clear and emphatic. If you believe on the name of the Son of God, “KNOW THAT YOU HAVE ETERNAL LIFE.” God wants you to know, not question or doubt. He wants you to be assured that He has rescued you from this world and you will be with Him for the long haul. I’m sure you remember John 3:16; it’s just as clear as the above verse. John 3:16: ”For God so loved the world that he gave his one and only Son, that whoever believes in him shall not perish but have eternal life. Notice that both verses I’ve presented so far say that those who believe have eternal life. It doesn’t say those who walk perfectly from the point in time they believe on Jesus have eternal life. It doesn’t say those who don’t walk perfectly don’t have eternal life. Man has added all these caveats to what God has said, and all those caveats distort the truth and reduce the magnitude of the assurance of salvation, turning it into a probationary period which makes the believer responsible for their own salvation. Now I’m sure somebody is going to contact me with a verse or two that seem to contradict the ones I’ve presented here, but before you do, I urge you to read those verses again. God’s Word cannot contradict itself if God authored it, which he did. Any verse you present to me has to fit with these plain and clear verses and dozens more like them. Here’s another verse for good measure, to make sure you get this fact. Ephesians 2:8-10 For it is by grace you have been saved, through faith–and this not from yourselves, it is the gift of God – not by works, so that no one can boast. For we are God’s workmanship, created in Christ Jesus to do good works, which God prepared in advance for us to do. You haven’t earned your salvation and even the faith you have was given to you by God as a ‘gift.’ Do you see that? God even gives you the faith you have. We’ll see how He gave you your faith later in this article. God didn’t say he wanted you to come to ‘a’ knowledge of the truth, but ‘the’ knowledge of the truth. God wants us to know the truth He has revealed in His Word of Truth. How can you know the truth if you don’t know God’s Word? You can’t. Truth comes from the Word of God. So does faith. Want more faith? Read and understand more of God’s Word. It’s that simple. The more truth you believe, the more faith you have. When you believed you were ‘born from above.’ That made you a ‘babe’ in Christ. God exhorts you, as a newborn babe in Christ, to ‘desire the sincere milk of God’s Word that you may grow thereby.’ God wants you to grow up spiritually in Christ. Babes can’t do what the mature can do in Christ. God needs mature people. However we all start out as babes and need the milk of God’s Word to grow up. Now let me say something very plain and simple as well. It’s time to grow up fellow believer. It’s time to get past teething on God’s Word, past the milk and onto the meat of the truth. It’s time to mature in Christ and become useful for the Master. How can you grow in the knowledge of Jesus Christ if you don’t study God’s Word? And if you study God’s Word but you misunderstand the meaning of specific words in God’s Word, how can you have the proper understanding of what God has revealed? Here’s an example. Say you read “Moses my servant is dead.” (Joshua 1:2). If you think Moses is still alive, what did reading God’s Word in Joshua 1:2 do for you? Absolutely nothing. Did you read God’s Word? Yes. Did you interpret it correctly? No. You changed the meaning of the word ‘dead’ to ‘alive.’ That’s not honest and it’s not correct. God wants us to grow up. He’s given us His Word so that we can do so. He wants us to get to the meat of spiritual truth. And this will we do, if God permits. Let’s go on ‘to maturity’ or as some translations provide, ‘to perfection’ in Christ. I Corinthians 3:1-3 And I, brethren, could not speak unto you as unto spiritual, but as unto carnal, even as unto babes in Christ. When the apostle Paul went to Corinth, he met ‘babes in Christ’ who were Christians long enough to mature but they were so carnal in their thinking and their lives that they couldn’t receive the ‘meat’ God wanted them to eat. He has to keep his teachings at the milk stage, focusing on Christ and him crucified. Is this not where most of Christianity is focused to day? Friends, believing Jesus is Lord and God raised him from the dead is the starting point, not the finish line. It’s where we begin, God has so much more for us, and we can be and do so much more for Him if we just grow up! But we have to learn God’s Word accurately for that to happen. There is an interesting section in Ephesians that describes how all of this has been designed to work. Let’s take a look at it now. There is so much in these verses that I ask you to think about them for a while until you get it — fully. Notice God wants us to be unified in the knowledge of Jesus Christ. He wants us, the body of Christ, to grow into ‘a perfect man’ which is measured by the fullness Christ is. He has placed five ministries in the body of Christ to accomplish this goal but if the ministers aren’t teaching the accurate Word of God, it won’t happen. The contrast to knowing and believing the truth is “being tossed to and from and carried about with every wind of doctrine.” When we don’t know what God’s Word really says, we are open to these doctrines of devils, as they are called elsewhere in God’s Word,. We’re divided by doctrinal issues and never come into the unity of the faith which is cemented by the accurate knowledge of Jesus Christ. I hope you have seen a bit of the value of studying God’s Word and letting it interpret itself to us. Accuracy matters. The person who told me we don’t need to know what particular words in God’s Word means because ‘we have the gist and God wants us to enjoy life…” must not have read the verses I’ve presented in this article. I will send it to him in an attempt to help him see how valuable he is to God and how much God wants him to mature in Christ. 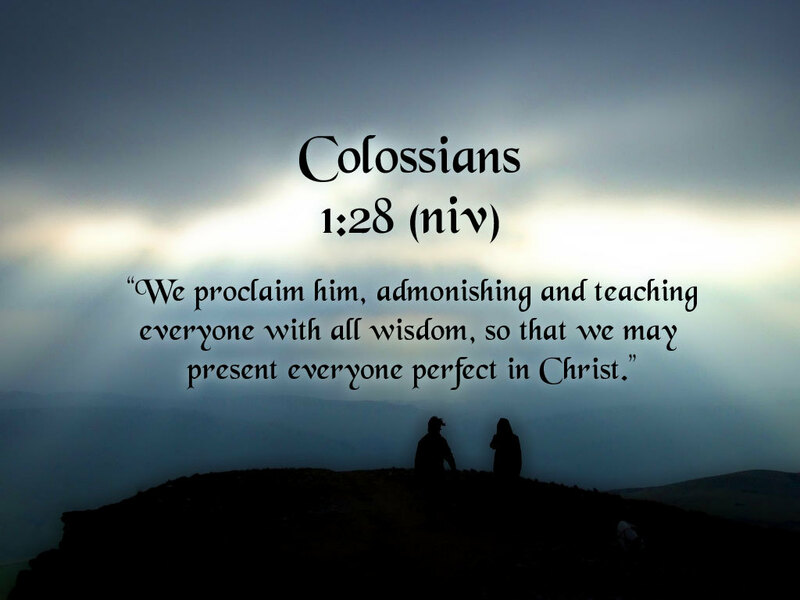 Colossians 1:28 [Jesus] Whom we preach, warning every man, and teaching every man in all wisdom; that we may present every man perfect in Christ Jesus. The goal of those in Christian ministry is (or should be if it isn’t) to ‘present every person perfect in Christ.” That will only happen if we teach the truth of God’s Word and not fables, misinterpretations and deliberate error. God’s Word is the basis of all we say and do, and if it isn’t then we’re just wasting our time and God’s. Many people think that being ‘perfect’ in Christ means not sinning. Oh it means so much more. Let’s get beyond the ‘do this and don’t do that’ mentality into become mature, powerful people who believe God through His Word and are able to serve others because of it. God want so much more from you than to live a good moral life. That again is the starting point. God’s given us his spirit and there’s power in that gift for us to serve others. Being good isn’t the goal, being a powerful child of God serving others the bread of life is. Let’s grow up in Christ by being meek to God’s Word of Truth.